This old site can still be used for reference but will not be updated. For any stock not yet appearing on the new site, please use the CONTACT US facility on the new site. 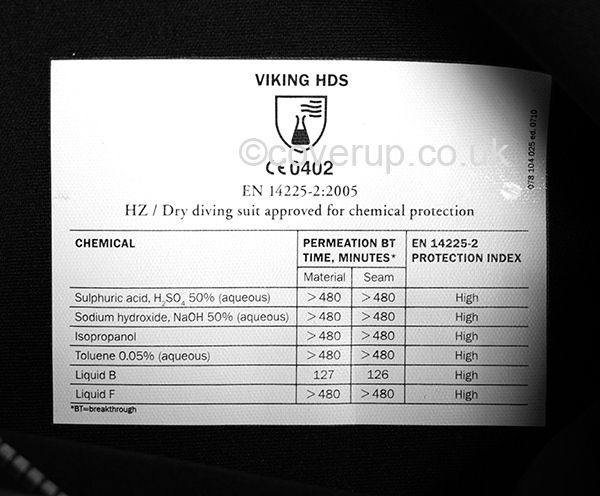 Viking HDS (Hazmat Diving Suit) heavy-duty drysuits are made for commercial divers for use in contaminated water and their quality is well-respected worldwide. Whilst this batch may not be the latest version of the HDS, they are available at a fraction of the price of today's version. They are non-standard in that the stated chest sizes do not appear to be accurate; there are also a few cosmetic blemishes, such as minor creasing and a little surplus adhesive on some suits. However, these blemishes are cosmetic only and do not affect the integrity of the suits. 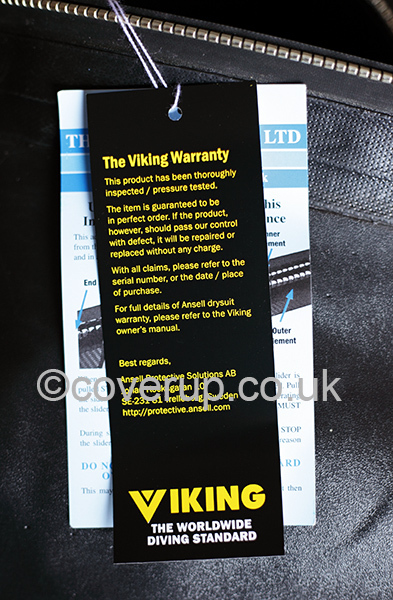 They have recently been professionally pressure tested as confirmed by the attached tag (see image below). They all have the standard latex neck and wrist seals and have had the valves removed and replaced by blank plugs, which can be removed for you to fit your own valves, if required. Each suit comes with a repair kit, zip lube, braces, manual, holdall and strong Viking carton. The table below shows the sizes shown on each suit's label, and also the size range that it would normally fit. Having measured every suit, the height appears to be accurate but in some cases the chest size is narrower than expected. Therefore, please select your size from the ACTUAL MEASUREMENTS column, considering the fit required and what will be worn under the suit. As with all drysuits, the seals will need trimming (instructions in supplied manual) to fit your neck and wrists. Buyers should try the suit for size before trimming the seals as we can not accept modified suits back. Holding the neck seal away from your throat for a short period will ensure safety whilst trying the suit for size. 88-108cm 9 - 9.5 49 43 34 "
88-114cm 9 - 9.5 49 43 34 "
100-116cm 9 - 9.5 50 44 35 "
106-122cm 9 - 9.5 55 50 34 "
108-124cm 10.5 - 11.5 52 46 38 "
88-108cm 7 - 8 48 43 34 "
100-116cm 9 - 9.5 50 44 36 "
106-122cm 9 - 9.5 54 50 34 "
108-124cm 9.5 - 10 52 46 37 "